I like to renovate my garage to a kitchen with bar and lounging room, all open concept. The length is 24ft, the width is 22ft. i need to have closet space room to put coats and shoes also a 1/2 bathroom. I also need a door to enter my back yard on the left side if i am walking in from the garage door. I need to eliminate that garage door also with a entrance door. I need everything it with a regular blueprint and a 3d plan layout with colors and furnitures. Need all the details from color of the floor to the cabinet all in details. Thank you. hello, nice competition. Can you tell me what is your budget for this project? You are still interested?Did you got a better image about what exactly you thinking, what are your expectations to look like? Any example? Thank you! what's the problem this time...??? Please let me know the following. 1) Steps on the right side wall, is it closer to the front wall or closer to the rear wall. 2) Is it door way to next room or steps to upstairs. 3) from the pictures I understand there is 1 window on the right side wall. Now you need additional 1 window and the above entry way also. Please let me know the following. i need to show steps to the other room on the right to side corner. thats the entry steps to the other room. should show 2 windows on the right side wall. i made an update to how it should be, hope it can help some of you with the design, thank you. Good Evening, I see you did not like the proposal I sent you and rejected it. So I ask you to tell me where my mistakes are so that I can improve them and stay in tune with what you like. Hi contest holder, may i know the height of ceiling? 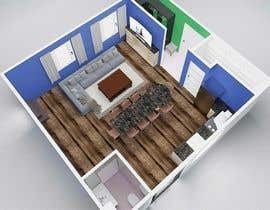 Dear sir 3d bluprints with amenities and interior designing or without interior designing? How are you ? I'll help you. CAN YOU ATTACHE PHOTOS OF THE EXISTING GARAGE?